This friendly Inn is located in a wonderful unspoiled area of the California coast halfway between San Francisco and Monterey - Carmel, where the Santa Cruz Mountains meet the sea. It is a perfect place for a romantic overnight or weekend getaway in a safe, warm and hospitable environment. The twelve colorful rooms, decorated by the artist-owners, have private baths and most have ocean views. Four are in the historic house next door, and eight are off the balcony above the Davenport Cash Store and Restaurant. Rates are from $78 to $ 140 for one or two, full breakfast and complimentary drink from the bar. All breads and pastries are made in our own Whale City Bakery. You can sometimes see the migrating gray whales from your room, or from the beach and scenic cliffs just across the road; and there are many nearby coastal areas and attractions to explore. 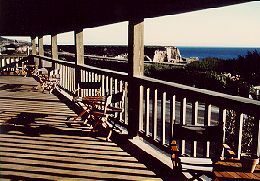 This and other Santa Cruz Bed and Breakfast Inns can be found here in The Register.